With so much stimulation and novelty at home and at school, the holidays can be a challenging time for students on the autism spectrum–and their peers in the classroom, too. 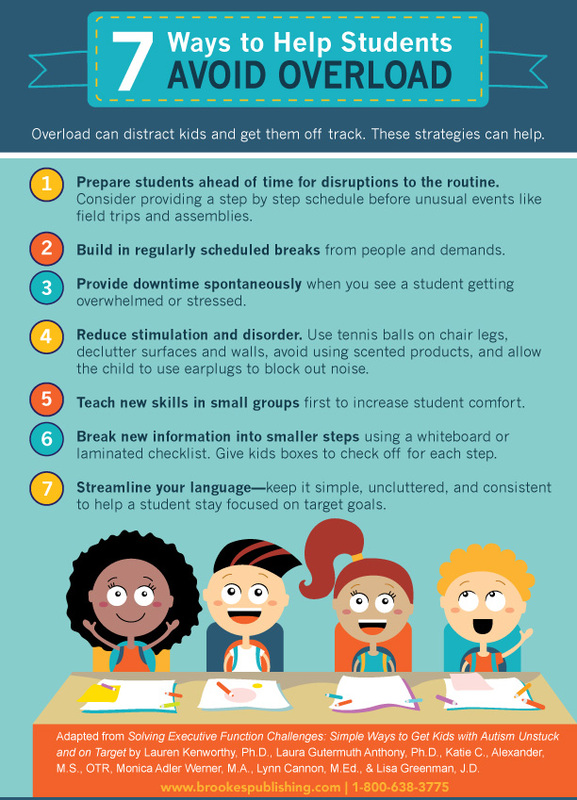 Today’s post gives you 7 quick tips on helping your students navigate this busy, often-overwhelming time of year without getting waylaid by overload. Prepare students ahead of time for disruptions to the routine. Before field trips, holiday assemblies, or other unusual events, spend extra time getting students ready. Consider providing a step by step schedule and reviewing which parts of the school day will be “like normal” and which will be different. Before a potentially challenging event, you might want to establish a reward for the child’s participation. Let him or her know in advance that work will be rewarded and identify that reward–maybe even give the student a choice between favorite rewards. Build in downtime. 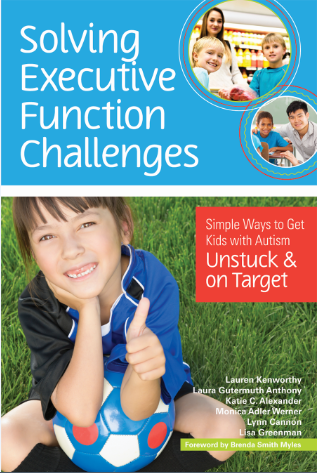 School can easily overload children on the autism spectrum or kids who struggle with social and executive function tasks. Regularly scheduled breaks from people and demands can help. Maybe your student can sit quietly in the resource room for 30 minutes and read, or choose to eat lunch in a classroom instead of a noisy cafeteria. Provide downtime spontaneously, too. Keep an eye out, and when you see a student getting overwhelmed or stressed, take action. You might ask your student if she’d like to be removed from a specific activity or suggest the student go to a quiet place for a break. Auditory: Put tennis balls on chair legs; use rugs, cork floors, and wall hangings to absorb noise; consider white noise machines or fans to block out unavoidable noises; and allow the child to use earplugs and headphones. Visual: Dim harsh lighting, declutter surfaces and walls, and allow the student to wear a baseball cap or sunglasses to help blunt the effects of too much visual stimulation. You might try seating the student next to calm peers, too. Olfactory (smell): Try to avoid using scented cleaning products, perfume, gum, and soaps. Tactile: If a student seems physically uncomfortable, suggest the student’s parents remove uncomfortable tags and other potential irritants from his wardrobe. Some children with ASD are also soothed and comforted by products like weighted vests. Teach new skills in small groups. For many children on the autism spectrum, it’s easier and less overloading to learn and practice new social skills with one other person. Then once they master a skill one to one, they can try it in a small group. Break new information into smaller steps. Use a whiteboard or laminated checklist to break down the steps for doing long division, writing a complete paragraph, composing a paper, or another important academic task. Provide boxes to check off for each step. Streamline your language. 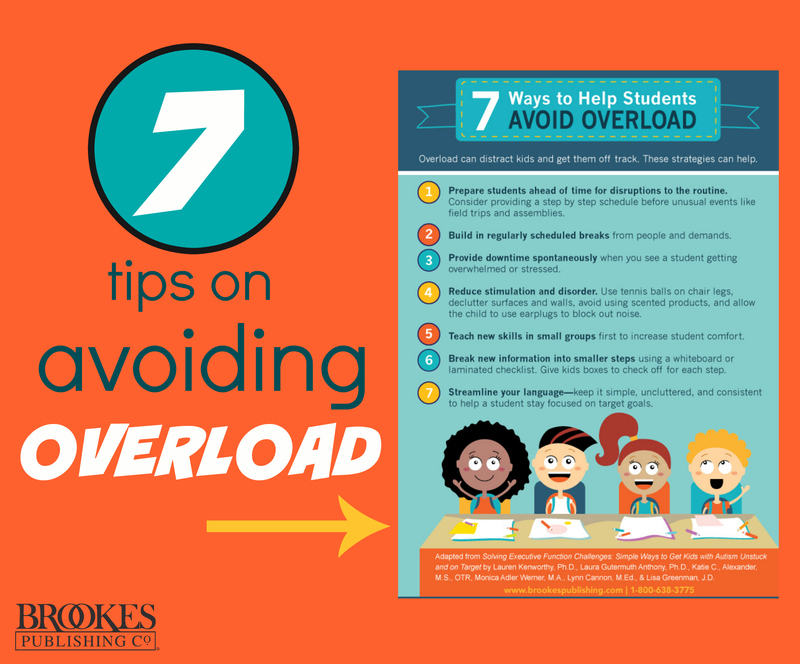 Help students avoid overload by keeping your language simple, uncluttered, and consistent. Every member of the education team should use the same words and phrases to help a student stay focused on target goals. Like these tips? Pin or tweet them in this handy shareable graphic!